Oh… hello! Don’t worry, it only feels like it’s been 100,000 years since our last Fodder foray. Today we’re taking an opportunity to look at a couple of new and upcoming additions to the Halo universe, and are glad you’ve come along for the ride. Shall we begin? Back at our Emerald City Comic Con panel, we unveiled the cover art for the upcoming novel Halo: Envoy. 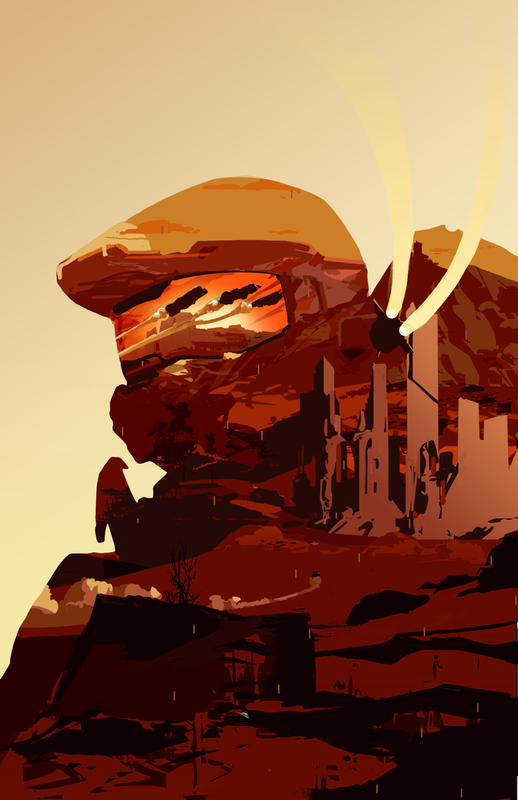 This gorgeous new piece by 343 concept artist Chase Toole (who also is responsible for many of the Forerunner-era art pieces in Halo Mythos) evokes a range of connected themes and emotions that readers will become quite familiar with as they read through the new tale when it hits on April 25. In fact, there are actually several little details tucked into the cover art, with some perhaps not becoming as obvious until you guys all get your hands on the book yourselves. And speaking of the art, click the image here for a sans-mechanicals version of the art that will turn your phone lock screen or background into a dynamic desert tapestry. Even as we worked through various editing iterations of the novel, I already found myself falling in love with some of the characters – human and alien alike. And as a lore fan, there are some scenes and interactions that are just… sublime. It has been six years since the end of the Covenant War...and yet on the planet Carrow, a world on the edge of the Joint Occupation Zone, a decisive new battle suddenly erupts. Human colonists and the alien Sangheili have already been living a tension-filled co-existence in this place, with Unified Earth Government envoy Melody Azikiwe attempting to broker a lasting peace between their two species. But as civil war now engulfs the Sangheili settlers, Melody must act on an additional covert assignment courtesy of the Office of Naval Intelligence: find a way to free the SPARTAN-IIs known as Gray Team, held in stasis since the end of the war by a cunning Elite fleetmaster consumed with vengeance. And none can anticipate the ongoing violence leading to the discovery of an even greater, unstoppable threat—one hidden for eons below the surface of the planet…. 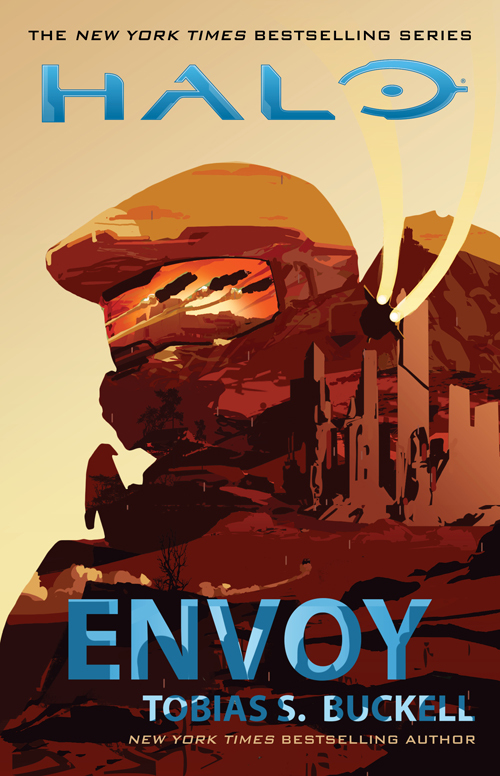 Halo: Envoy lands on April 25, and you can preorder your own copy right here (and in audio book form). 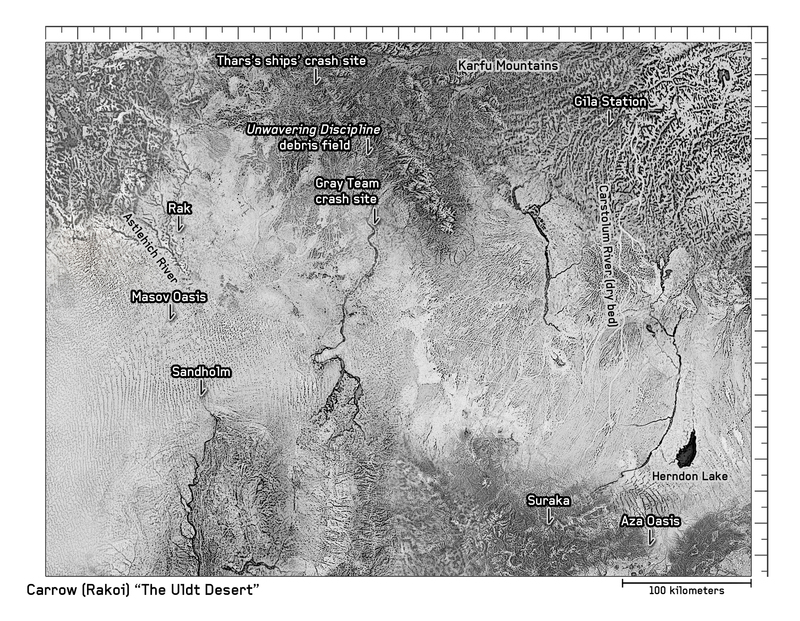 One of my personal favorite little additions to come alongside Halo: Envoy is the inclusion of an illustrated map that showcases the relevant regions and landmarks on Carrow that readers will encounter throughout the novel. Drawn and doted on by 343’s own Sarah Campbell, the map is a simple and awesome experience-enhancer that goes a long way in helping fans build an even more vivid mental picture of the events and escapades described in the book, and we thought it might be a fun tease to let you get an advanced lay of the land, so to speak – a little bit of reading-recon to helped get you hyped for Gray Team’s return. To get you even further primed for what’s to come, we sat down (virtually) with author Tobias Buckell to gather some of his thoughts on the process, and on working in the Halo universe. A: When I wrote Dirt I was trying to wrap my head around the whole history of the universe from a grunt’s [little “g,” not big “G” – Grim] perspective. As a result, I ended up writing this sort of life story of a common soldier in the UNSC that took place over all the history. It was a way for me to firm everything up in my head, but I also felt that a recounting of everything from a tighter perspective might be interesting for readers. A sort of ‘Why We Fight’ story. For The Cole Protocol, I was trying to delve into Cole’s backstory, but also explore a little bit of the universe that maybe fans hadn’t seen before. As for the biggest difference between now and then, it’s about how much there is to know. When I wrote Dirt we had, if I recall, three of the games and five novels? I think there was a graphic novel as well. I was able to re-play through all three games (for weeks my wife would come home and find me just playing the games all the way through again), read the five books, the graphic novel, and then start work on The Cole Protocol with everything completely fresh in my head. I’d consumed All The Halo Things. That’s actually why I was compelled to write Dirt. When working on the new stuff, I realized I couldn’t replay every single game, read every single book all over again, and all the comics, and the movie series, and so on. GRIM: Talk a little bit about your recent contribution to Halo: Fractures, “Oasis.” How is it either directly – or indirectly – related to Halo: Envoy? A: Oasis is a look at the world of Carrow and the political situation there right before the novel Halo: Envoy starts up. Carrow is in the Joint Occupied Zone. It’s a powder keg, because while you have this idea of the JOZ being controlled by both Sangheili and humans, but it’s on Carrow that they end up both living on a world right next to each other. Suddenly this idea of Joint Occupation means you have individuals with freighted histories all living within driving distance of each other. People who are all damaged in one way or another by a massive war. Oasis looks at a human family, refugees, who have come to Carrow to settle down and put the war far behind them. And what happens, they’re just across a desert from Sangheili. 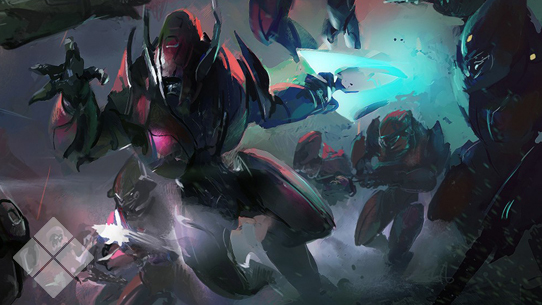 Sangheili who, from their perspective, were the aggressors not that long ago. And on the Sangheili side, there are individuals who have lost in the war as well, who are angry that they’re being forced physical space. And while there are people trying to negotiate some kind of peace, it doesn’t seem to be holding. Halo: Envoy is about what comes next after Oasis, when the powder keg is lit. GRIM: What are some of the big differences in approach that you take with writing a short story like Dirt or Oasis, versus writing more traditional “full-length” novels like Halo: The Cole Protocol and Halo: Envoy? A: The novels are fun because you can play on such a larger canvas, so you can jump from one point of view to a new one. You can really play out the bigger stories and clashes of groups of people. Short stories require me to really focus on the character of one person and what they’re going through; there’s an intensity that short stories require. GRIM: So, speaking of Halo: Envoy specifically, what are your favorite aspects about the story? What are some of the things you are most excited about – without spoiling anything – fans getting to experience? A: It’s so hard not to talk about my favorite bits without spoiling. I mean, it’s obvious I love throwing Gray Team into new and complicated situations – I love their Dirty Dozen point of view. Spartans are fun, but other Spartans are more ‘Yes Sir’ than Gray Team. Gray Team was never quite right, and they’ve been out in the dark a long time. I also really enjoyed Melody Azikiwe in this book. We’re writing military adventure with lots of guns and explosions, but I think it’s the human stories that make a compelling book, and she’s stuck between a rock and a hard place. She’s been sent to wrest peace between groups that just want to kill each other. That’s so tough to pull off, and that makes her a tough personality. GRIM: Woooah, okay TB, that’s far enough… Moving on, with both Halo: The Cole Protocol and now with Halo: Envoy, you’ve dealt with the strained and tenuous environment of humanity working and living in close proximity with an alien race – in two very different, but equally volatile time periods. Is that a circumstance that you are particularly intrigued by? A: I think I am. It gives me a chance to explore the aliens and their perspectives on what is going on around the universe. But I think as a writer, you’re looking for places of conflict, and two very different groups being side by side or working in and amongst each other is a natural place to find complication. GRIM: Can’t argue there! Tobias, thanks so much for joining us today – we’d love to have you back again, maybe after folks have had a chance to dig into the book. Any final words or thoughts for fans before they embark on Envoy’s journey in a couple of weeks? A: It was great to be back with Gray Team. I’m psyched to have gotten a chance to write another Gray Team story and jump back into the Halo universe once more. One of the most frequent questions I get via email is ‘when will Gray Team be back?’ So, I really appreciate fans who’ve emailed or tweeted their enjoyment of The Cole Protocol, and I hope this holds up for them as being as fun a read, and I hope the wait was worth it. GRIM: I have no doubt it will be, my friend. We move from turbulence to tabletop with our next Halo: Fleet Battles update. Our friends and partners at Spartan Games has two new additions to the space-faring tabletop game, and as is standard fare, we’ve got some sweet new background details to go right along with it. This Autumn-class Heavy Cruiser represents a considerable leap forwards in human warship design, and is a testament to the UNSCs post-Covenant War technological prowess. Using improvements and modifications made to the Halcyon-class light cruiser for Operation: RED FLAG as a starting point, the naval architects at SinoViet Heavy Machinery have added energy shield-reinforced armor, powerful fusion drives, long-range targeting matrixes, and a state-of-the art magnetic accelerator cannon. These new weapons and systems are continually being improved to give the UNSC a competitive edge in battles against Covenant remnants and other threats that may yet arise. 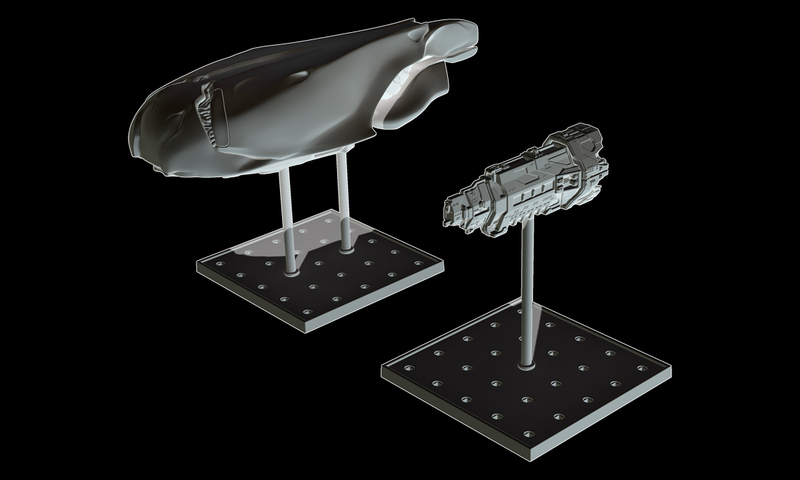 In Halo: Fleet Battles the Autumn-class is the first UNSC warship to incorporate post-war technologies, with System Loadouts previously only seen on Covenant vessels, such as Defense Arrays. It’s MAC also benefits from updated gunnery systems, represented by the new Advanced Targeting special rule. In boarding actions the Autumn-class can be upgraded with ODST Strike Teams: veteran fighters who can stand toe-to-toe with the Covenant’s best! These ancient ships slumber no more. These ships of war are relics dating to the foundation of the Covenant, recovered from fleet ossuaries to fight once again after its dissolution. 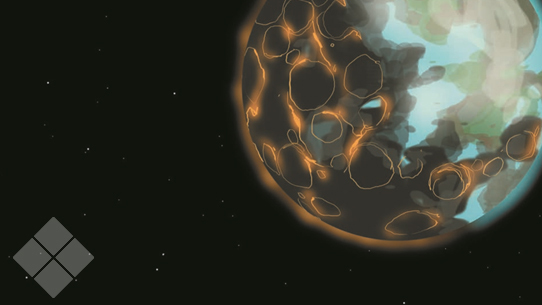 Though ancient in human terms, the Carracks’ reactors still burn with the fury of caged stars and their hulls shimmer with nigh-unbreakable shells of energy. In the modern era they have found a role as versatile cruisers and carriers, reinforcing naval battle groups and transporting armies under the flag of a dozen factions and would-be warlords. In Halo: Fleet Battles the Carrack relies on its hull strength and short-range plasma beam rather than the array of ultra-tech countermeasures and lances normally expected from Covenant vessels. It can smash through resistance to deliver its Hunter assault cadres and deliver devastating Plasma Cannon Array broadsides. Once a Carrack closes in, the shipmaster can order the use of Plasma Overload, unleashing a devastating torrent of energy but causing significant stress on the hull. Click the individual ship titles above to snag copies for your own tabletop tirades – or just to fill some Halo-sized spaces on your collection shelf! That will do it for this issue. As many fans have already noted, we’re coming up on a pretty awesome milestone for your favorite fiction feature, and we’re excited about a few different ways we’d like to celebrate, so be sure to stay tuned and keep an eye out for more in the future. 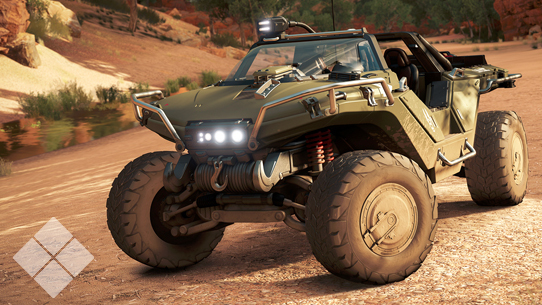 Until next time… Live well, play Halo, and watch your back while out in the desert.